We understand that life happens and unexpected things come up, so naturally patients can forget to schedule their regular cleanings. Pinnacle Marketing Group has designed these proven effective, premium 7” (w) x 10” (h) folded-over reactivation letters with envelopes, for your practice to mail to patients that haven’t been in recently. 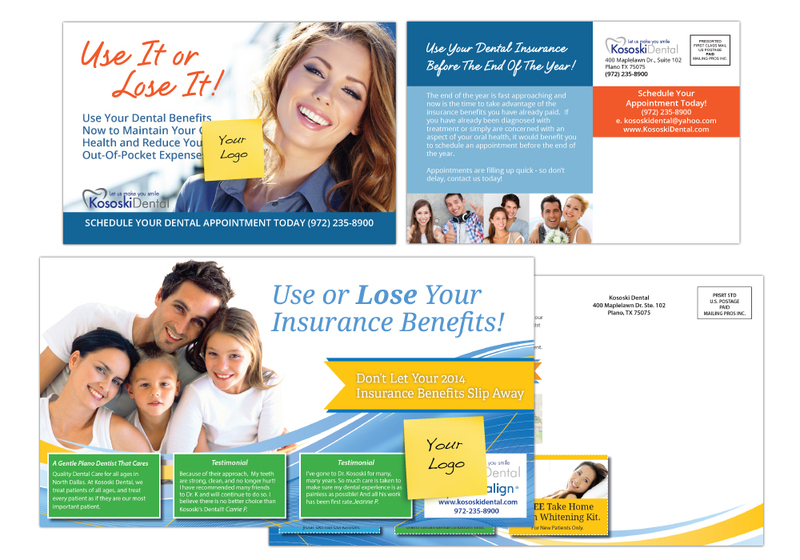 Pinnacle Marketing Group has designed these proven effective, premium 9” (w) x 6” (h) or 11” (w) x 6” (h) direct mail cards, to remind current patients that their dental benefits are going to expire at the end of the year. Market to current patients as well as to prospective new patients in your area. We recommend you mail (1) Use It or Lose It postcard to every patient in the last quarter of the year. Typical typesetting and proofing process takes 3-5 business days. Printing and shipping takes 5-7 business days. Printed and mailed as low as $.35 per piece.